The Chinese PGZ95 SPAAG aka Type 95, is a Self-Propelled Anti-Aircraft Gun that can also operate in a battery with a command vehicle. The system is capable of tracking targets with its own radar. It also has a tracking camera, infrared tracking camera and a laser rangefinder which feeds information to the onboard fire-control computer. This gives the vehicle a maximum automatic tracking range of ,000m while the infrared tracking camera has a maximum range of 5000m allowing the vehicle to full fill the low-level air defence role. The system was designed and developed by the Northwest Institute of Mechanical & Electrical Engineering based at Xianyang, Shaanxi province. 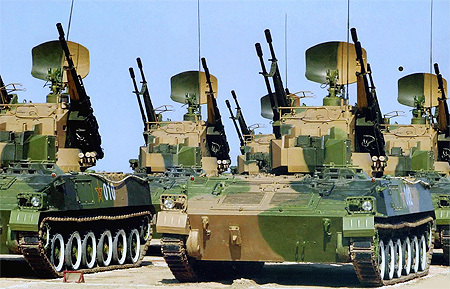 The system entered service with the PLA ground forces in the late-1990’s and believed to have benefited from the technology used in the Italian SIDAM-25 SPAAG. The one turret is equipped with x4 25mm chain guns. They have a rate of fire of 600 to 800 rounds per minute per barrel. About 1,000 rounds of 25mm ammunition are carried, and the empty cartridge cases are ejected outside of the turret. The system can be reloaded via an automatic loading mechanism. The PGZ95 can be fitted with four QW-2 IR-homing, short-range surface-to-air missiles. The missile is derived from the shoulder-launched variant QW-2, which is very similar to the Russian Igla-1 (SA-16 Gimlet). This is claimed to have an effective altitude from 10 to 3,500m and slant ranges of 500 to 6,000m.